James Wyld, WYLD’S MILITARY MAP OF THE UNITED STATES, THE NORTHERN STATES, AND THE SOUTHERN CONFEDERATE STATES, WITH THE FORTS, HARBOURS, ARSENALS, AND MILITARY POSITIONS. London: James Wyld, [May 1861, per Stephenson]. Steel engraving[? ], 33 ½”h x 23 ¼”w at neat line plus margins, original outline and wash color. Segmented and mounted on linen for folding. Colors bright with very minor soiling, numerous reinforcements to linen splits on verso. Original case no longer present. 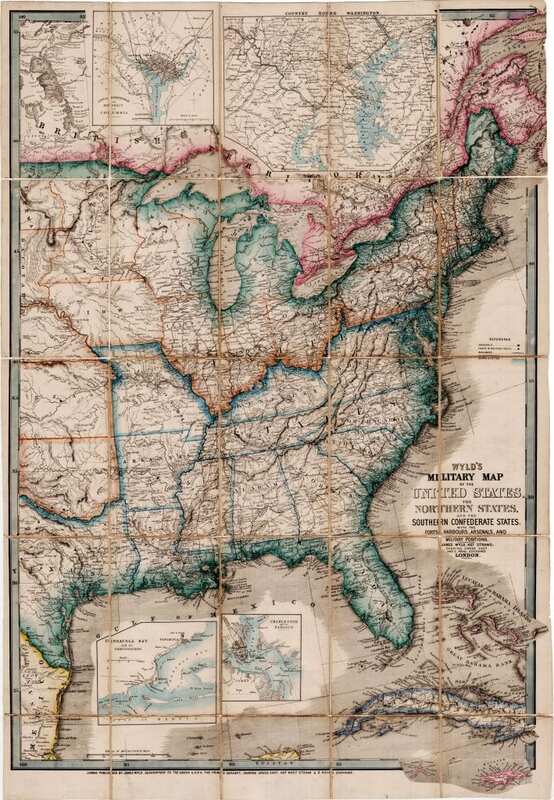 A scarce map of the United States published in London in May 1861, particularly notable for its misrepresentation of the Secession Crisis that sparked the Civil War. The Crisis was of the utmost interest in Great Britain, where public opinion was deeply divided regarding whether to recognize the Confederacy. Many were appalled by the continued Southern embrace of slavery, which had long since been abolished in the British Empire. Others argued that the states of the Confederacy were a vital supplier of cotton to British manufacturers. It was feared that a failure to recognize would result in the disruption of this flow of raw material, causing economic disruption and social chaos. In any event, though it was at times a close call, Great Britain never recognized the Confederacy. 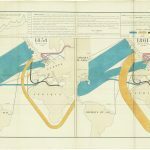 Nonetheless, the question was very much in the air, and this map would have been of considerable interest to its British audience. The use of the phrase “Southern Confederate States” in the title has the effect, whether intentional or not is hard to say, of conflating slavery and secession: When viewing the slave states on the map prominently outlined in blue, a British observer could be excused for thinking that they had all seceded. 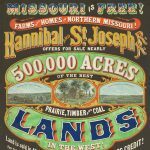 In reality, as of the map’s publication on May 1, 1861, Arkansas, North Carolina and Tennessee had not yet seceded, and Maryland, Kentucky and Missouri were never to secede at all. Rumsey #1246. 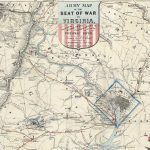 Stephenson, Civil War Maps, #19.